Our beautiful daughter Sofia Quinn was born May 27th, at 5:59pm. She was 7.15lbs and 21.5 inches long! My labor started early Wednesday morning, I woke up around 3am when my water broke. It was a slow leak and like every pregnant woman who has their water break, I wasn’t sure if this was the infamous “umm thats only pee” or hope to goodness my water had really broken. But over the next hour there was no question, it was definitely my water. I was so excited and also relieved that my baby was finally on her way! May 27th seemed like a great day to welcome my baby girl into the world. My contractions started soon after but they were about 20-25 mins apart and felt more like braxton hicks than anything you would associate with real labor. I laid in bed and tried to rest but there was no going back to sleep for me, how can you when you know you the baby is on her way?! Around 6:30 my daughter Ariana woke up and we snuggled in bed, enjoying the morning and relishing the last morning before she would become a big sister. We finally got up around seven and got ready for the day, we planned to drop Ariana off with a friend around 9am. Beto “My husband” took the day off of work and our first stop was breakfast at the Donut shop, I was still feeling great and in the mood to celebrate little Sofi’s birthday. After dropping our daughter off we called my midwife to let her know I was in labor, next we stopped at my amazing chiropractor for one last adjustment before the big push. I credit my chiropractor in helping give me an amazing labor and delivery. (although I may have got her table “slightly” wet after getting adjusted.) But to all your pregnant mommies I think having everything aligned and in correct placement makes a huge difference in easing labor and making contractions as productive as possible. Around 10am my contractions were a little closer at 15 mins apart but they still were not any more painful than a braxton hicks. We decided to go to the mall and walk around for a couple hours, we need to be in active labor by 24 hours so I really wanted to get things going. We got to the mall and started walking and I began having contractions every 4 mins that last about 45 seconds, they became painful but not unbearable. We spent two hours roaming the mall, and drinking lots of lemonade. Around noon we left the mall and stopped over at our birthing center to check in and see how we were progressing. I was dilated to 4cm. I was so happy to hear that I was progressing and just had 6cm. to go! It was lunch time and since we had lots of time we decided to visit one of our favorite pizza shops for lunch, I wasn’t actually hungry but it seemed like a nice way to pass the time. This was when my water really started leaking, it had been a slow leak all morning but after changing pants twice we decided to head home for a bit so we could relax and and have not worry about leaking all over public floors. I spend the next two hours walking around the house and bouncing on my birth ball, I am not sure how much the birth ball helped but they say its great for labor and it was a nice place to sit. At 3:30 we felt rested and decided to go walk at a plaza near our birthing center. I still felt like we had lots of time but wanted to closer and not worry about 25 mins of traffic, it was a pretty hot day so we ended up going to walk in Whole Foods. It was at this point when I finally started to feel some pretty real contractions, my husband was happy about that. (My first labor was so much harder, so in comparison all my contractions had felt easy) after 15 minutes of leaning on the cart and trying to keep my face relaxed so I wouldn’t scare the busy shoppers around me we decided to head over to the birthing center. I still didn’t feel like the baby was coming but I just wanted to sit down and let my body do the work. I texted my midwife to let her know we were on our way! 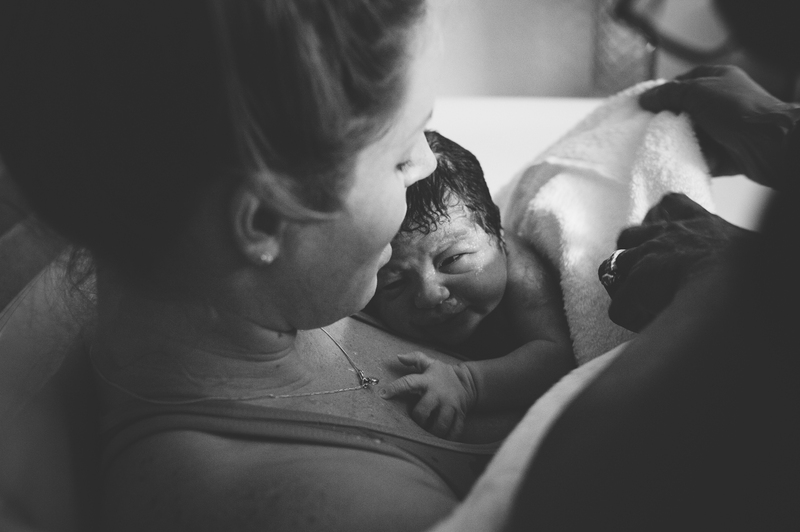 We arrived to the center around 4:30pm and they had a tub of warm water all ready for me, I had decided early on in my pregnancy that I wanted a natural water birth. And let me tell you, warm water is heaven on earth. It was so comforting and helped ease the pressure of my contractions. At this point I was about 6cm dilated so we were definitely making progress! Thirty minutes in the warm water and I could definitely feel my contractions getting stronger and moving the baby down, the contractions were lasting about 60 seconds and were about 2 minutes apart. (I think, it could have been a little less. We were not timing them at this point but I had a nice break between each one) Around 5:30 I was (an hour after we arrived) I started feeling the pressure of the baby coming down and actually started pushing. I am not sure how many pushes it took but this was the hardest and most amazing part of my labor, once little Sofia’s head and shoulders were born the midwife let me reach down and deliver her the rest of the way. It was so beautiful to be the first one to hold my baby! Sofia was born at 5:59pm and received a 9/10 Apgar score. I want to give a huge thanks to my husband for being there and cheering me through the whole process! Also to my amazing midwife Jualeah Early and all the accommodating staff at Baby+Co, together you all made it possible for me to have the best birth experience possible.